When my fridge is full, life is good...when my fridge is less than full, magic takes over. I've talked to you all before about my friend, Elizabeth, who has Fat Moon Farm. She has a ton of pea shoots right now and I am in PS heaven! 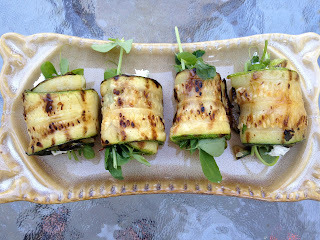 I had been wanting to make a different version of grilled zucchini since my Grilled Stuffed Zucchini and this was a perfect spring time option! I don't have much to say today...this recipe has almost left me speechless. Almost. Pea shoots didn't make it in this shot...they were getting washed. Oops! 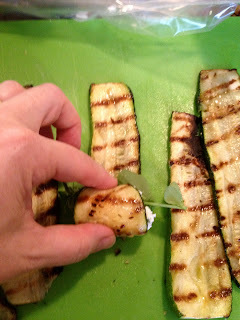 I take the goat cheese out of the fridge to soften and turn the grill on (or use a grill pan) while I am slicing the zucchini. Using a mandolin would be exceptional here but since I don't have one (yet! ), I just use my trusty chefs knife. I find it easier to stay straight with it rather than something small like a paring knife, but that's just me. Use whatever works for you! Once the zucchini is sliced I put it in a zip top type of bag and add a few tablespoons of the garlic pepper oil. If you don't have it ready or don't want to make it, it won't be a deal breaker here. Just use regular olive oil or an already flavored one of your liking. I hope my husband reads this to see that I can in fact be pretty easy going at times! Close the top of the bag getting as much air out as you can, then rub the bag around to get the zucchini coated well. 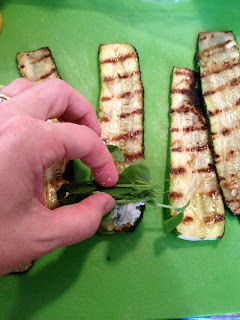 To the grill you go...it just takes a couple of minutes per side since these are thin zucchini we're using here. 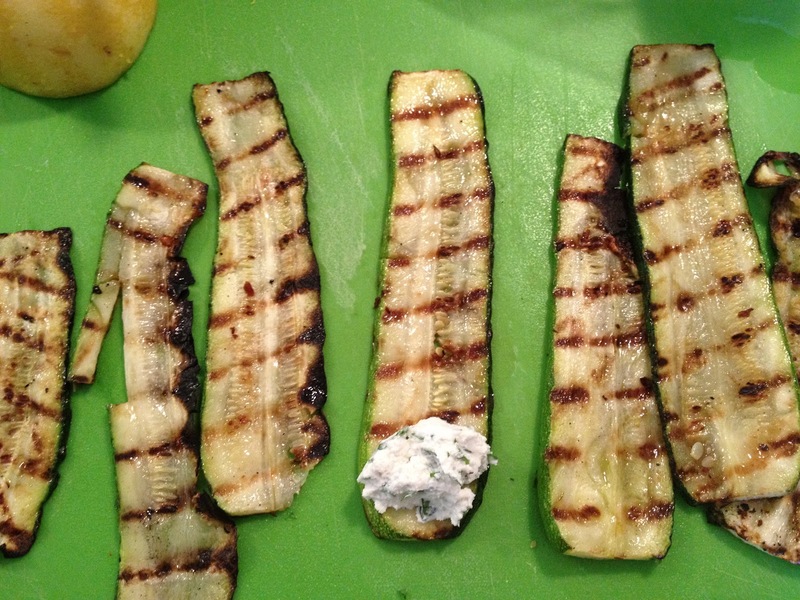 Get some pretty grill marks then put them on a plate to cool a bit and work on your filling if you didn't get it done it earlier. In a small bowl add in your goat cheese, garlic scapes (or regular garlic if you don't have Fat Moon Farm around the corner! ), basil, parsley, pepper and lemon. Give it a good mix to incorporate everything and set up an assembly line, it just makes it easier! 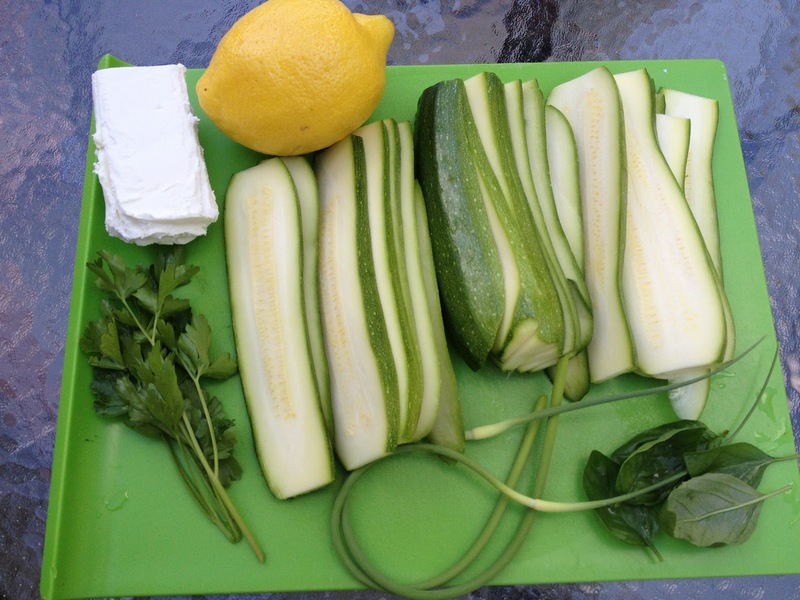 Start with your zucchini and add about a teaspoon of your herbed cheese to one end. Top that off with your pea shoots or other green. 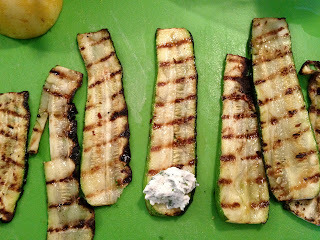 I think I am off to the kitchen store to score a mandolin now...I'll be making these all summer! Bon Appetit...it's time to eat! Sounds delicious! I added some pea shoots to my garlic scape pesto after trying yours at Fat Moon :) I hope Elizabeth has more scapes this week! Yummy...I reckon this would work well with eggplant too. Cooking is relaxing for me. 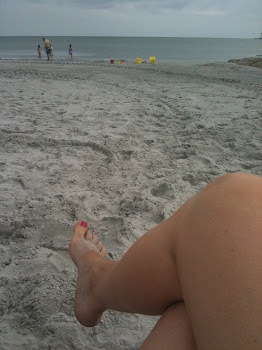 My kitchen, along with Target, a good library and a beach are my happy places. 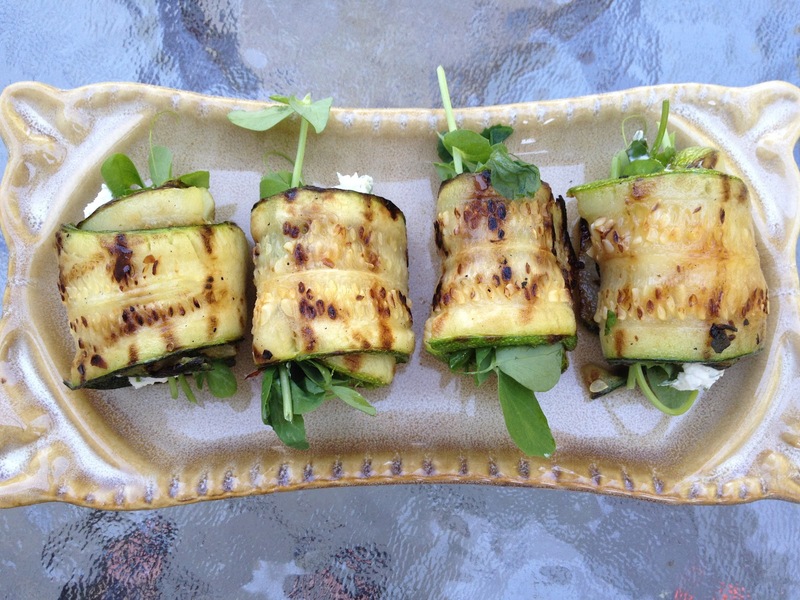 I love to put my spin on a recipe and try them out on friends and family. Sometimes they love them and sometimes, well hey...no one is perfect. I do this to have fun and share the things that work. 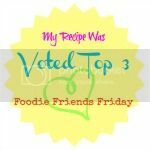 I hope you enjoy these recipes as much as my family and I do.